How did we get here? What happened? How did it suddenly become acceptable for grown-ups to spend their time colouring in? For anyone who has sat with a child and helped them colour in, it is undoubtedly a rather pleasant experience (except when the child in question takes a thick, black crayon and starts going over the lines undoing all your good work. That can actually be quite upsetting). Adult colouring books began a few years back with a smattering of tongue-in-cheek books marketed at the young and hip. Those in search of an ironic gift could give their nearest and dearest a book from Mel Elliot’s Colour Me Good range starring outline drawings of the likes of Ryan Gosling, Damian Lewis, Taylor Swift or Benedict Cumberbatch. Michael O’Mara Books were one of the first publishers to produce a more ‘mainstream’ colouring book in 2012 with the ‘The Creative Colouring Book for Grown Ups’, i.e. something you were actually meant to colour in – properly. In 2016, there are now adult colouring books on every conceivable theme from Harry Potter and Game of Thrones to a neat little pocket book featuring Liberty of London textile patterns. And so here we are. Modern life is so stressful, we apparently need to sit down and colour in to recover from it all. But whether you view colouring in as a harmless creative activity, or a mindless (as opposed to mindful) harbinger of the fall of civilisation, the advent of colouring-in, back in the 19th century, is rooted in surprisingly similar principles. According to Wikipedia, the concept of colouring in was first suggested as a way to democratise art and was inspired by a series of lectures by painter Sir Joshua Reynolds, and the works of Swiss educator Johann Heinrich Pestalozzi and his student Friedrich Frobel. The belief was that colouring in led to spiritual edification and was a way to enhance cognitive abilities, so improving future prospects. Latching on to this idea, the first colouring book, ‘The Little Folks Painting Book’, illustrated by Kate Greenaway, was published in the United States by trailblazers McLoughlin Bros. in 1879. It’s worth mentioning that early colouring books were intended for paints and even by the 1930s, when crayons had become widely available, colouring books were produced with the aim of being suitable for either paints or crayons and continued to be called ‘painting books’ for quite some time. 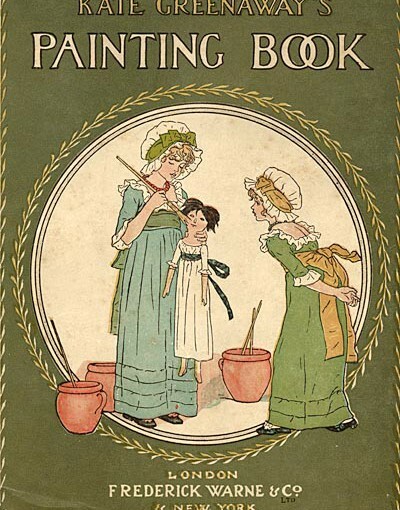 We do not have ‘The Little Folks Painting Book’ at the library but we do have several other early examples, not least another Kate Greenaway illustrated book entitled simply, ‘Kate Greenaway’s Painting Book,’ published by Frederick Warne. Untouched by childish hands, this edition is in ‘mint’ condition, but rather more interesting is ‘The Merry Moments Painting Book,’ also published by Warne, where most of the outline drawings have been coloured in with crayon, the young artist carefully replicating the full printed version on the opposite page. Probably done at least half a century ago, it feels all the more charming for it. We also have a couple of beautiful colouring books by the animal artist Cecil Aldin as well as a 1930s ‘Magic Paint Book’ made by Renwick of Otley, which has clearly never come into contact with water. Tempting though it is to see if the ‘magic’ still works after all these years, we shall return it safely to the shelf without trying. Those of a certain age will also remember colouring in Christmas cards and we even have examples of these from the 1960s and 70s via the Medici Society archive. Mary Evans Picture Library is awash with images that are begging to be coloured in though rest assured, any colouring in these days is done digitally and no crayons or coloured pencils are allowed near our collection of Victorian periodicals (some of our city panorama engravings from the Illustrated London News would keep even the most experienced colour-inner going for days). Fashion illustrations from The Tatler, domestic scenes from Girls’ Own or Good Housekeeping magazines, cartoons by Heath Robinson and H. M. Bateman not to mention hundreds of beautiful nursery illustrations by artists such as Margaret Tarrant from the Medici Society archive – all have massive colouring in potential for avid colour-inners who are looking for something with a historic or vintage flavour. Inspired by the potential of our archive as a treasure trove of colouring in material, we felt it only fair to compile and share with you our own colouring book. It’s a little alternative, and, may we say, not for the faint-hearted, and it’s most definitely aimed at the adult market (though it’s all in the best possible taste). We should warn also warn you that, rather than calming and de-stressing, this is a colouring book to excite and stimulate the parts other colouring books don’t reach. Not for us namby-pamby vegetation, ocean worlds or furry animals, THIS is a colouring book that looks at the seriously colourful side of history. Sharpen your pencils and prepare to bring to life in full technicolour the past’s most risqué, decadent and bizarre from across the centuries. And please do share the fruits of your labour with us on our Facebook page. This is one kind of adult colouring book we think is seriously worth the effort! Click here to download your copy.